Real Tennis, the sport of kings--circa 700 years ago. Can you imagine tennis without the balls? Tennis balls have undergone an incredible journey. That journey goes back over 700 years or more. Before there was tennis as we know it, there was a game called Real Tennis, the original racket sport from which the modern game of tennis is derived. 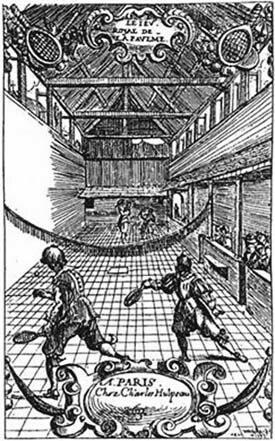 Real Tennis, coined the Sport of Kings, started in England in the 1400's. The game was played inside on an oval court with balls that didn't bounce, weird rackets and a scoring system and rules that would confound any serious student of the game. But they did use some sort of ball. The balls in those times were often made of cork, with fabric tightly wound around the cork, and covered with a hand-sewn layer of heavy woven woolen cloth. But since there were no uniform balls in Europe, they could be made of pretty much anything that could fit inside the covering including animal intestines. Rocky Lang has been involved in the motion picture and television business all his life. He has produced, written and directed motion pictures, documentaries, television shows, movies-of-the-week and mini-series. He produced White Squall, starring Jeff Bridges and directed by Ridley Scott. He is also the author of nine books. Rocky is an avid tennis player and has been certified as a USPTA tennis professional. His next book written with Barbara Hall, is Letters From Hollywood, to be published by Abrams Books in 2019. Click Here to visit Rocky’s website.